Nothing screams spring in your garden quite like Forsythia. With their vibrant yellow color, these perennials are one of the first bushes to flower in the spring. The shrub is very hardy, and relatively easy to grow. These tips for growing forsythia bushes will make sure that your garden is a delight to behold in early spring. 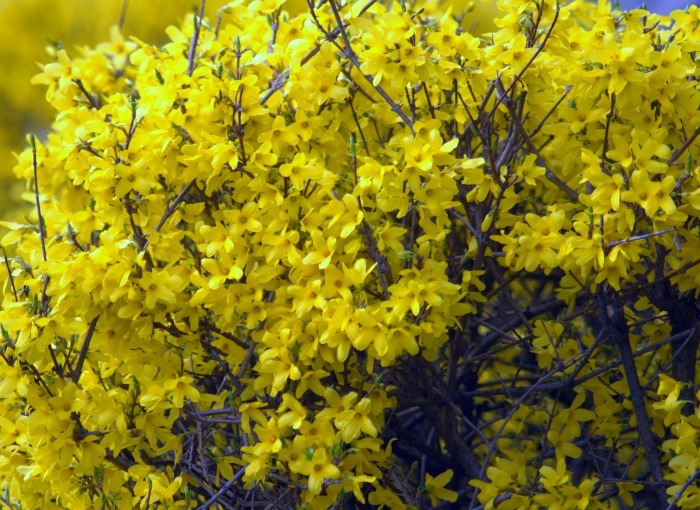 Forsythia bushes add a dramatic look to your front yard in early spring. At just about the same time that the daffodils are in bloom, a well cared for forsythia bush will also have a wonderful display of flowers going, too. The bright yellow blooms arrive first telling us that spring is right around the corner and brings a pop of color into a dead looking winter landscape. Mr. Gardening Cook is fond of bringing me free things for my garden. One winter, he came home with about a dozen hellebore plants that he was given. They flower in the winter and give me so much pleasure. Once he found out that the plant was destined for the trash heap, he got out his ax and “divided” it into 7 forsythia bushes for me. This is the way they look now, just a couple of years later. Can we say magnificent? I have my breakfast on the deck every morning, and get to enjoy this amazing display of spring. Tips for Growing Forsythia Bushes. When to plant – You can start growing forsythia pretty much any time of the year but fall is a good time to plant. This allows the plant to get developed before the first round of flowering starts in the spring. Forsythia bushes can become overgrown very easily, so they need to be tended to keep a manageable shape and size. See my tips for planting forsythia here. The post gives tips about rooting and transplanting the shrub, as well. Sunlight – Forsythia does best in a sunny spot. Mine are in my back yard and get 6-8 hours of direct sunlight a day. They will grow in a slightly shadier spot but direct sun is best. My row of forsythias get some shade from the neighbor’s trees in the late afternoon, but that is about it. Watering – Once established, forsythia bushes do not need much watering, unless you have a REALLY long stretch of dry hot weather. I have had many summers with 100 degree days for several days in a row and my bushes still did not need watering. Mulching is the key to this since it helps the soil to retain the moisture tht the ground does get. 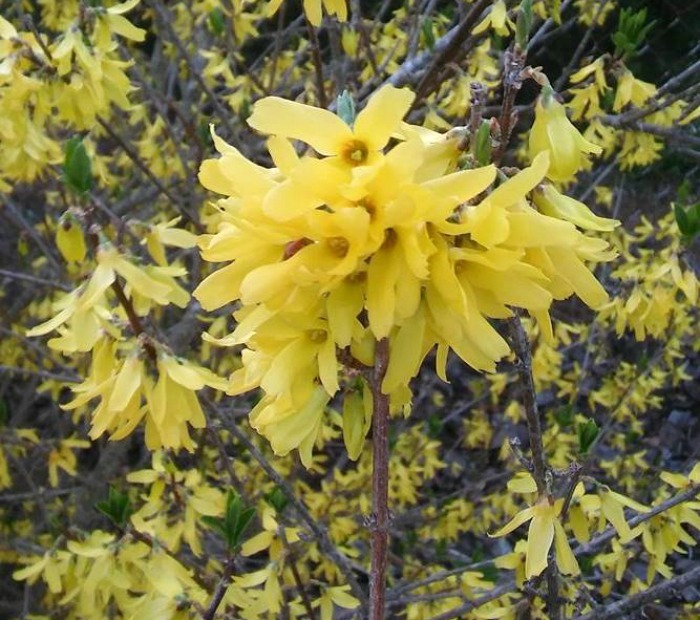 Soil – Grow forsythia in well draining soil. If your soil is very wet, or marshy, they will not grow well. A good helping of organic matter such as compost is always a help to them. Mulch around the plants to keep the moisture in the soil and to keep the weeds away. Flowers – The flowers of a forsythia plant appear on the stems before the leaves do in the spring. Before you know it, the whole plant will be covered in yellow blooms and there will not be a leaf in sight! They generally appear as single petals along the stem but some of mine also have larger clusters of flowers that are very pretty. This usually happens on an area of the branch that has been pruned, or lopped accidentally. Leaves – The flowers will bloom for several weeks and then the leaves will start to grow. They appear here and there at first and then cover the whole stem as the flowers start to drop off. Once the flowers have dropped from the stems, the plant will not bloom again until the following spring but does have lush green leaves all summer long. About mid way through the flowering cycle, you will have a combination of both leaves and green tips growing at the same time. 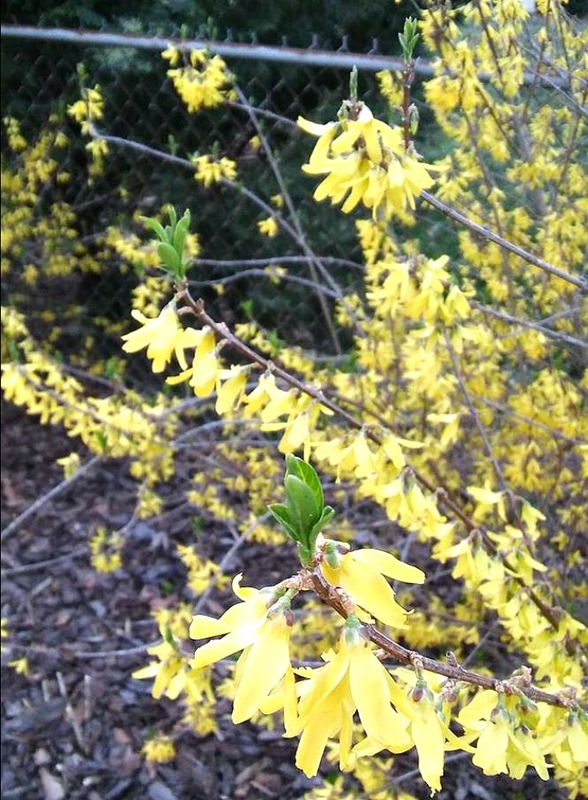 Cold Hardiness Zones: Forsythia are cold hardy in zones 5-8 which means that it will take temperatures to about -20 º. If it gets colder than this, it can damage roots as well as flower buds for the next season. Fertilizing – If you fertilize, use a balanced formula designed for flowering shrubs and tree in the spring and summer. Don’t use fertilizer in the fall and winter, since the plant is dormant then. Wait until after flowering to fertilize. Pruning – Forsythia is best pruned in the early spring right after the blooms have faded. If you wait until the fall to do the job, you will reduce the number of flowers that you will get the following spring. 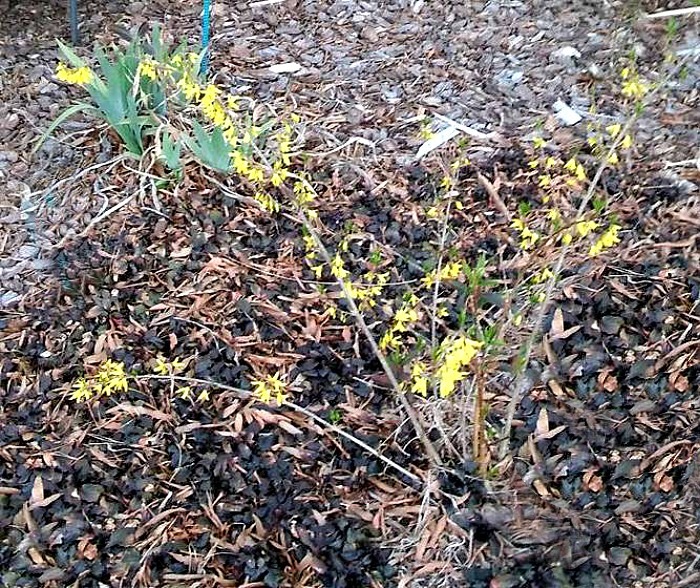 Forsythia blooms on old wood and they set their flower buds soon after the new growth appears each year. To prune a mature forsythia shrub, cut about 1/4 of the oldest and thickest branches, very close to the ground. If you try to tame it by cutting some of the longer, new branches, they will fork with new growth and you’ll end up in an unruly looking shrub. If you have a very overgrown and older forsythia like the one above, the pruning can be quite brutal. In this case, either heavy renovation pruning or hard pruning is necessary. See the differences between the two and how to manage this job here. And if pruning won’t do the job, you can move your plant. See my tips for transplanting forsythia here. 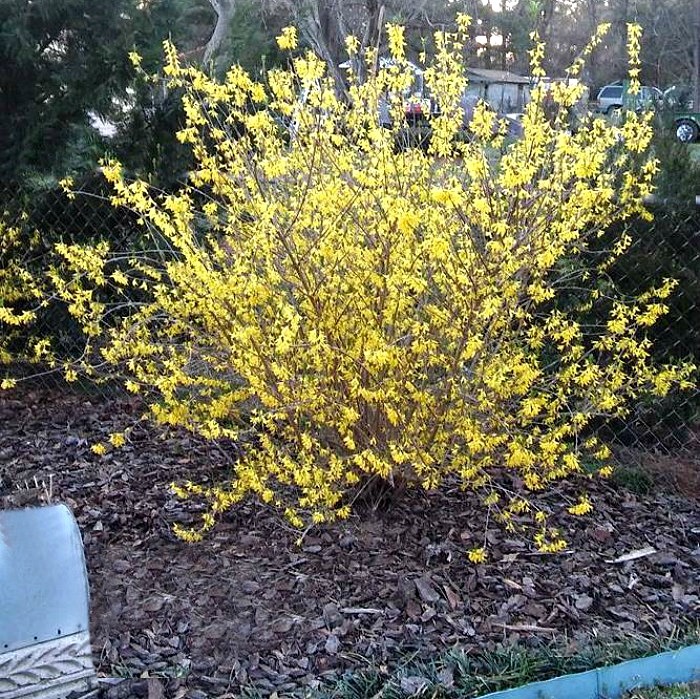 Get more Forsythia plants for free. 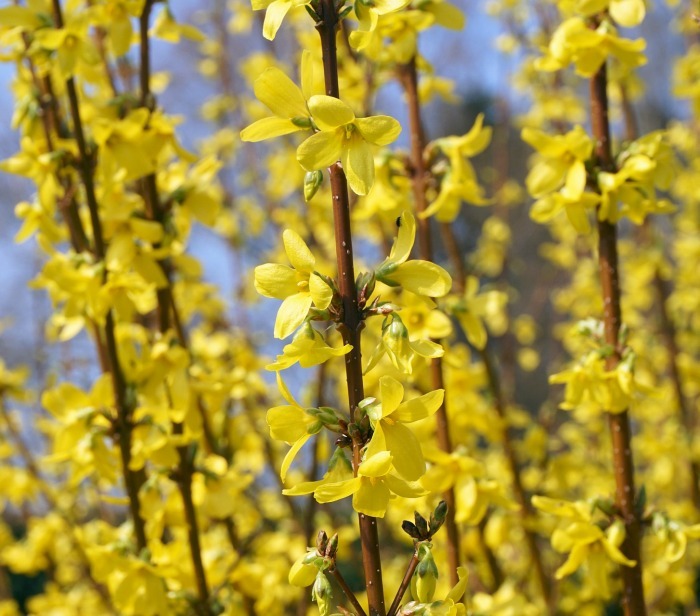 Propagation – Forsythia bushes are grown from cuttings. The best cuttings are those from new growth, since they will root most easily. Just place the end into moist soil and keep it evenly moist until the stem roots. This takes a few weeks. Another way to get new plants, is to lower a branch down to the ground and hold it in place with an arched piece of metal. The part of the plant that touches the soil will root in a few weeks! Transplanting forsythia seedlings is best done in the winter when the plant is dormant. The plant below had a branch that touched the ground naturally and it rooted without being pinned down. Once it was established, I moved it to another garden bed and I have a small shrub growing this year. 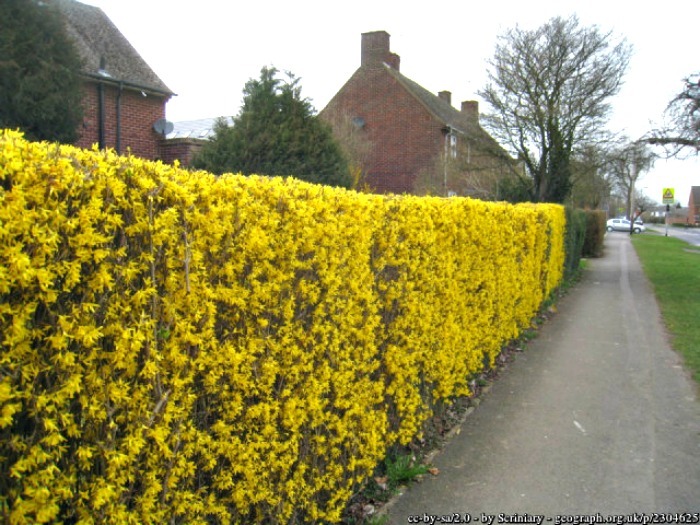 Forsythia can be grown into a hedge. Growing Forsythia as hedges. Forsythia can be grown as a hedge but you may remove much of its flowering potential, especially if you prune it through out the year. So prune early to shape the hedge, and not too much during the year, if you can. Forcing Indoor blooms – Want to get a read head start on spring? 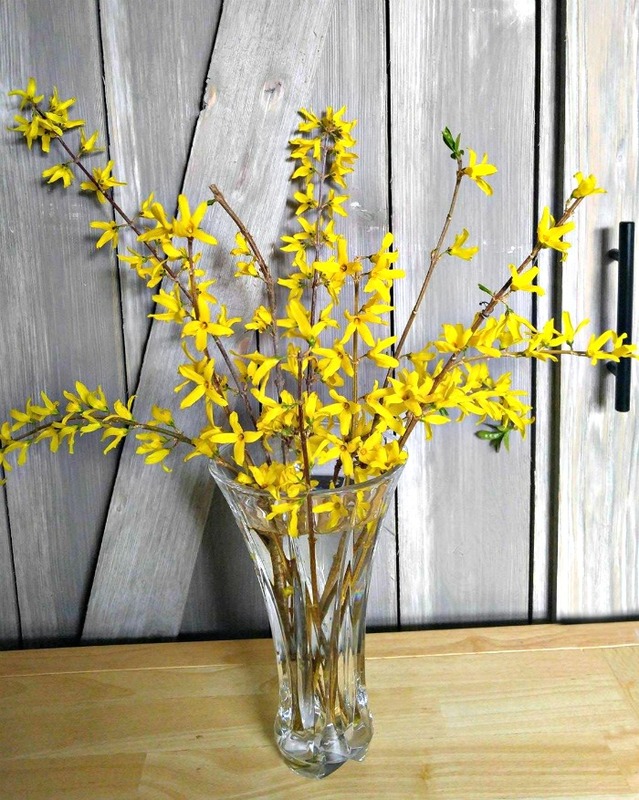 Try forcing forsythia indoors. It is really easy to do. Just cut off a few branches and bring them indoors. Hammer the base of the branches, or cut into them, to open them up a bit and place them in a vase of water. In a couple of weeks, the branches will burst into bright yellow blooms, right in the dead of winter! It’s a great way to feel that you have hurried spring along indoors. Forsythia is sure to put a smile on the face of any gardener. It is one of the first signs that spring has finally arrived and is a delight to have in your garden. 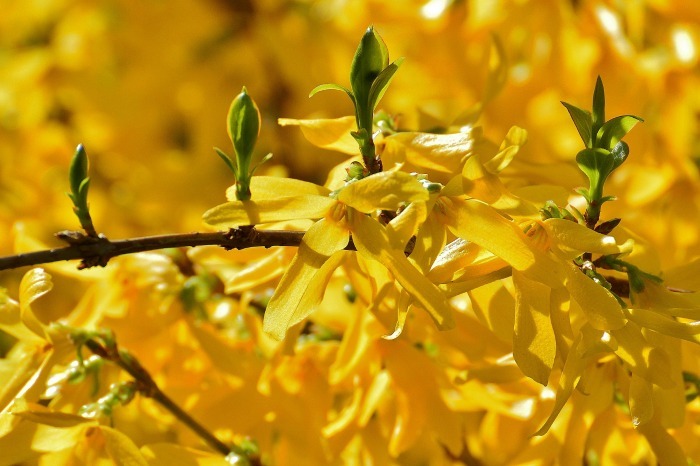 By following these easy tips for growing forsythia, you, too, can have an amazing display of spring in your garden. iLife in Central Alberta, Canada, and have a Forsythia plant on the edge of my vegetable garden. Each year it appears to struggle to put out its flowers, with very few that bloom at the bottom of the branches. Is it the location in the garden? in the province or country? Or my ignorance as to how to care for it? Help! 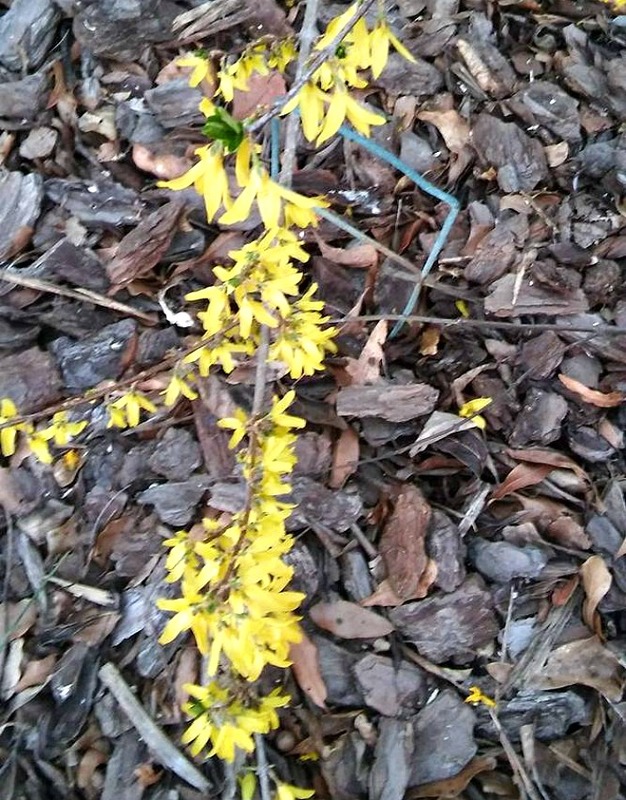 I live in Central Alberta, Canada, and have a Forsythia plant on the edge of my vegetable garden. Each year it appears to struggle to put out its flowers, with very few that bloom at the bottom of the branches. Is it the location in the garden? in the province or country? Or my ignorance as to how to care for it? Help! I’ve recently planted several baby forsythia bushes. Some are doing well but some have many leaves that are going brown , wilting away from the top of the branches. They are sparse looking and about two feet tall. Is this normal? Hello,I had one when I live in Atlanta and love them but now I live in southeast Texas will it do ok.